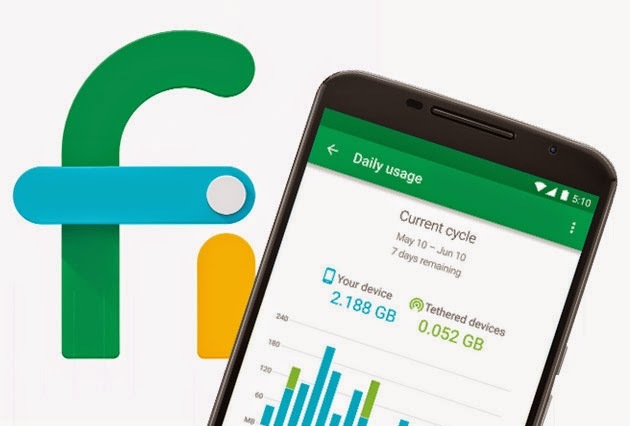 With the introduction of Project Fi, and the rapdid proliferation of its users, there have been many inquiries surround the signal icons and what they all mean. This post aims at becoming the definitive guide to these signals and is designed to hopefully provide as much clarity as possible. The goal of this document is to be so simple, that even my mother would understand what is happening with her device and data should she see any of these indicators. 4G - Newest and fastest network. Has the capability (but not on our devices yet) for HD voice, calling and data usage at the same time (for most 4G networks, except Sprint Spark), and better capacity for more users with more bandwidth. You can do anything on this network you could on your home computer, assuming you have a good strong connection. 3G - 3G networks are a more widespread fallback. They provide adequate data speeds for email and messaging, but not for streaming videos. You will not be able to talk and send data over CDMA on Sprint, but you can on T-Mobile. 2G - If you need to call someone, this network will do. But if you want message or load something over data, don’t bother. It isn’t going happen. T-Mobile has the largest left over EDGE network and is supposedly swapping it out for LTE in all markets by mid/late this year. You most likely won’t see this unless you’re traveling in rural areas. Now that you have a decent understanding on they types of networks that potentially exist while using Project Fi, we can review the different connection indicators you may see in your notification shade. These inidcators help tell users what level of connectivity they are currently experiencing, including cellular, wifi and data connectivity (both mobile and WiFi). If you are already connected to Wi-Fi and a ! appears, then no data will be used, but you may not have internet. Check on the status of your router and ISP. Hopefully this document helps you understand what is going on with your Fi Phone connections. I'll bookmark this for when (if?) I ever get my invite. CDMA "3G" data is called EVDO (or EV-DO) and CDMA "2G" data is called 1xRTT. "Edge" is only available on GSM carriers (in this example, T-Mobile). What about the letter "R"
That just indicates when you are Roaming. This list is incomplete.. I had a E signal instead of H the other day. Take a look at the top chart it shows 2g Edge (e) as the third option in the chart. I saw a "G" above the cellular signal icon yesterday. Anyone know what that means? Scott is correct. I believe that's short for GPRS. What does it mean when the cellular strength indicator goes dark except for the bottom row where three white dots continuously stream to the right? This is accompanied by slowdown of whatever the phone is doing, whether or not it requires a data connection, and the slowdown happens in spite of the presence of a strong work connection. The slowdown lasts for just a couple of minutes & then the normal tower strength indicator returns. Slowdowns in applications that don't require a data connection can be corrected by putting phone in "airplane" mode. I have not experienced that other than during the few moments that its switching networks depending on the coverage area I am in. I've been having the solid triangle no letters issue for a few weeks now. I noticed when I turn off wifi my LTE comes back. Is it an indication that wifi is being used for everything SK there is no data being used via the cell network? I'm going to second the issue that was mentioned (but skipped) before regarding the grayed out signal strength indicator/triangle paired with three flashing white dots along the bottom. It only happens when the phone (Nexus 5X) refuses to do anything internet-related, but it doesn't say that there's simply no service. Haven't been able to find anything that explains this icon as of yet. I have only seen those when the phone is searching for a connection. It used to happen all the time immediately upon ending a call and lasted for about 15 seconds or so. That issue has gone away and I mostly see it when I come out of an area that has no coverage at all and back into a coverage area such as when taking the train to NYC I lose complete signal in the tunnel and when I come out it searches for a second or two and connects. What about a signal symbol with an"x" to the upper left of it? Follow up question, then. Why would my mobile data be disabled? You may have accidentally disbaled it in settings. I came here with the same question. Turns out my cell data was disabled. Not sure how it got disabled, as I would never do that, but re-enabling it worked -- I now have an "H" symbol. I am using Project Fi abroad in the Philippines and was about to just get a local SIM, but to my delight/disappointment, it turns out all I had to do was re-enable cell data. What about the signal symbol with an "x" to the upper left of it? Happened after I installed the latest system update. For wifi assistant to work does wifi also have to be turned on? Is the VPN key the only way to know you're connected? I believe an "X" next to the signal icon is indicative that "Cellular Data" is disabled. Verify your settings for that option. Does that mean that my phone 'sees' this CABLEWIFI wifi hotspot, but I can't utilize it? If not, in my neighborhood, outside of my house, the wifi icon is not active, just my LTE cell source. Is that normal? My wifi assistant is ON. Do you happen to use Optimum cable? Scott, thanks for your reply. OK, you've confirmed what I thought. In Honolulu there are two cable companies. Time Warner Cable and Hawaiian Telecom. Time Warner Cable is the largest, and I suspect it is their signal that I am seeing. I am not a Time Warner Cable customer. I sometimes see a symbol that is basically the normal cell signal triangle, with LTE in the upper left, but a small x in the bottom right. I have confirmed that I haven't disabled data or anything, and when I have this symbol present, I can't seem to access the internet on my device. What does this symbol mean and do you have any advice for getting around whatever problem it represents? I figured out this means that if your in a call or if your in a bad area it just means no data. It won't happen all the time it mainly happens when your on T-Mobile towers. I downloaded. Nice app that lets me know which tower I'm running on. I've recently seen a key with a "g" directly above it. Amy ideas on that? Just got my Fi phone a week ago. This article answered my questions about all he different symbols i see next to my signal, so thank you for that. I have two questions though. 1. When outside populated areas, often times i will have full cell signal with no symbol next to it. No wifi, i'm driving, but even with this full signal indication, i am unable to place or receive calls or send text. Also, the project fi app says to connect to a network. Do you know why that is? I used to have U.S. Cellular and project fi has recently adopted U.S. Cellular as a carrier. I always got signal in these areas with U.S. Cellular, so why would I not get signal with Project Fi? Second, mostly informational. Why can't you message someone over 2G? We used to do it all the time before 3G came about. When 1X came out it was a big deal. I am having the same problem as you described in #1. Were you able to fix it? Unfortunately I can't view the right side of the tables using my phone. Websites like this are easier to view if your turn the phone sideways and let it reorient. What if it's a X to the right most of the signal bars, and it's getting LTE? It happens to my boyfriend's pixel and not as much on mine, it's confusing. But the data isn't disabled. Unless you mean the phone is disabling it by itself? But the data isn't disabled. Unless you mean the phone is disabling it by itself? That's the big issue I'm having, is because we never disable our data, and it clearly is saying that we have a data signal it just adds the X too. So I don't know what it's trying to say. I'm starting to get nervous. I've only seen the wi-fi assist key once (a month ago). I travel around Philadelphia and South Jersey extensively. How is it I'm not hitting any Google certified/safe wi-fi hotspots? Why some phones shows 4G and some shows LTE? I have a moto x pure addition and I'm always getting the H on my service bar. now from reading you say that its a form of 3g. I can only talk and text when I have it. I cant do anything with data. I'm using a Pixle XL. How do I know what carrier I'm using at any given time? Am I able to force it to use one of the other Google Fi carriers? I have a Google Pixel XL. How do I know what carrier the phone is using at any given time? Am I able to change it to a different Google Fi carrier if I wanted to over ride the carrier Google Fi chooses? I use an app called Signal Check lite to see what network I am on. Thank you Scott. The "Signal Check" app is perfect. I originally thought an icon on the screen indicated the carrier. Thank you again. Thank you Scott. The Signal Check app works great and has helped me understand what carriers I am using. I also have experienced the three dot phenomenon recently for two consecutive days, while the phone operated normally otherwise. Mysterious! Dial *#*#FIINFO#*#* yo know what carrier you are connected to, don't need to install any app. Recently the 7.1v was downloaded to my Droid Maxx 2. Since then, I have a small white x in a small black square positioned on the lower right of my normal wifi icon. I cannot connect to my home wifi which is routed through my Netscape 300 to my home internet which is provided by Charter/Sputum, TWC, BRIGHT BOX, and whoever they have merged with in the last half hour. I have checked the, cable signal, my coaxial cables, reset the cable router, reset my wifi router, data saver is off. Error message received, when using the Wifi option in phone settings, is usually "connected, no internet". But occasionally it just reads "not connected". Any help would be greatly appreciated. I do not want to pay Verizon for "data overage". Sometimes, I have a small x by my wifi indicator on my Pixel 2. This happens on and off while at work. It is a hotel connection that requires a password every 12 days to reconnect to the network, but my phone sends a notification when I need to sign in. I will get the small x on and off throughout the day even when I've already typed in the password. I know this usually means "connected, no internet" but if I'm streaming music, I don't have any service loss and I can still load websites with the x. When I open my wifi settings, it just says "connected" even if the x is there. I'm trying not to use data, but I don't know if I should trust the icon or the menu. I have no way of knowing for sure if I'm using data or the wifi connection. Small black exclamation point in center? It is staying on no matter where I am----. Home/work,etc. ? Upside down grey triangle with question mark?